Ultimate Comics Spider-Man #23 - People who’ve worn the webbed mask have abandoned being Spider-Man before. The cover of this week’s Ultimate Comics Spider-Man #23 riffs on the classic John Romita image from Amazing Spider-Man #50, when Peter Parker quit. And I want to say that Ben Riley stopped web-swinging because of angst, too. But I could be wrong about that. 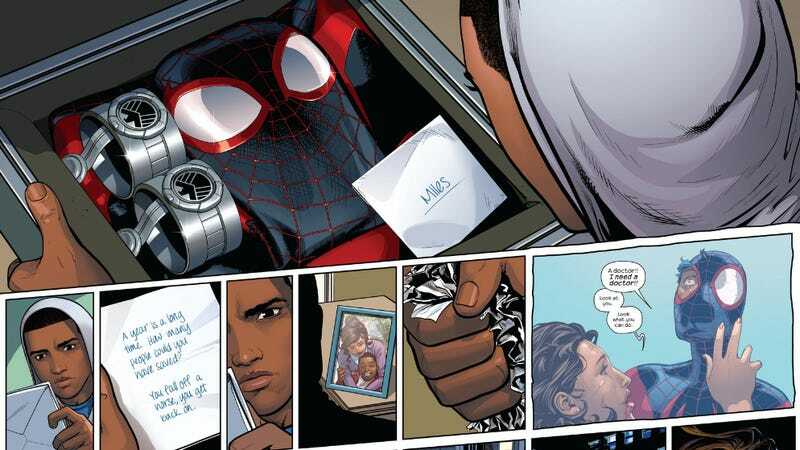 What feels different about Miles Morales’ abdication of the Spidey identity is the proximity of trauma to the event. Unlike Peter Parker not being there for Uncle Ben, Miles was there when the bad stuff happened. His wounds must feel especially raw. And then you’ve got people from all sides pressuring to talk about his feelings and/or start being Spider-Man again. Writer Brian Bendis and David Marquez make Miles feel so much younger and vulnerable than Peter Parker and that makes me feel for the kid even more. You know he’s gonna get back in the suit and you feel so, so bad for him in this moment. Batwoman #19 - Another Bat-family reunion happens in this issue. Don’t expect anything happy, though. It’s a testament to the writing of this series that I’ve kept reading even when co-creator J.H. Wiliams isn’t drawing it. I felt the last arc was a bit over-written but the emotional punch of this issue is a turn for the better. I like how the end of this issue assembles a group of partners/loved ones around Kate. This story beat happens even as Batman’s family unit is crumbling and dissipating after both the Death of the Family storyline and the murder of Damien Wayne, the most recent Robin. If it were a fair fight, you might even think that Batwoman has a chance in taking Batman on. But it’s never a fair fight when Batman’s involved. Fatale #14 - The thing to love in this issue of Ed Brubaker and Sean Phillips’s dark magic noir series is how human the monsters feel. Usually, anything derived from Lovecraftianmaterial generates villains that feel aloof and removed from human concerns. But the way that the Nazi Cthulu entities curse and react to the conflicts in these pages makes them more engaging—and worth hating—than the usual cult-of-bad-guys. This installment also fills in a bit of the lore for the Fatale universe and, of course, makes everyone in this book feel even more wonderfully damned.